Luxurious, opulent, and elegant, the Titanic was the most sophisticated and magnificent passenger steamship of her day. 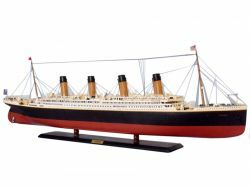 With incredible workmanship, Handcrafted Model Ships pays a one-of-a-kind tribute to the Titanic and her remarkable story, from gift-sized 14” models to truly remarkable 72” museum quality replicas. Rich with history, faithfully reproduced with unparalleled accuracy and realism, find the perfect Titanic model ship for you. Our Titanic model ship is an elegant accent for the executive office or the perfect gift for the inquisitive and creative child. Crafted by master artisans, and detailed with exquisite precision, from vibrant paints to the minutiae of crow’s nests, lifeboats, rigging, and skylights, enjoy this amazing replica replete with the Titanic’s legendary history. Enduring not only because of her tragedy, but because she stood as a symbol and testament to human ingenuity and ability, the Titanic was a true marvel; a breathtaking wonder to behold for all who had the opportunity. We honor the memory of her remarkable creation and fateful journey with our masterfully rendered Titanic model ships. Handcrafted Model Ships has even taken it a step further with our Limited Edition Titanic models, each featuring countless additional details and a certificate of authenticity, as well as our 40" Titanic with Lights model ship, which sports LED lights to depict a dazzlingly realistic view of the Titanic cruise ship at night. Showcased on a wall-mounted display shelf or in a rosewood display case, our Titanic model ship is an elegant addition to both the home and the office.